My dad left for New York in 1961, he took a Greyhound out of Lexington with a cardboard suitcase and a couple of art books he'd found somewhere around the UK campus. Names rattled around in his head the whole ride up. Paul Klee. Franz Kline. Rothko, Motherwell, de Kooning. His father, my grandfather, managed a Southern States feed co-op in Irishtown. He was a Kentucky Colonel, fought in the Ardennes. He sold salt licks and baling wire to Bluegrass farmers. He didn't know the first thing about Abstract Expressionism, had no interest in learning. Art, or at least his son's interest in art, was an embarrassment to him. 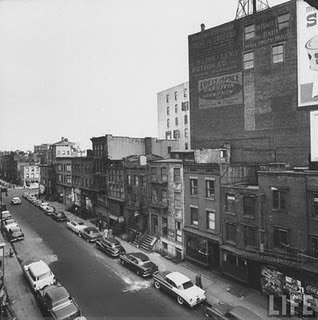 My dad found a two room apartment on Sullivan Street, bathroom in the kitchen and toilet down the hall, and took a job somewhere in the Garment District. He worked with Jewish girls from Brooklyn, Dominican guys from Queens. He heard Spanish being spoken for the first time in his life. Ate dinner in the Automat. Everything was new to him. On Saturdays he'd try to paint something, but nothing came. He'd pore over his art books, bring back postcards from the Museum of Modern Art. He smoked, drank coffee, listened to the radio and he stared out his window at the traffic passing by. He rode the subways out to the ends of their lines. The L to Canarsie. The R to Coney Island. He'd sketch compulsively, trying to catch something, he didn't know what. On his 18th birthday he went to a bar and bought himself a beer. He started coughing, he started coughing and he couldn't stop. When he starting bringing up blood he took the bus over to Bellevue, where a young doctor from somewhere told him he had double pneumonia. You need rest, the young doctor told him. You need fresh air. This city is not your friend.